We all want to be successful, however, shy away from committing ourselves to a documented plan. In this article, let me touch upon on the importance of career planning in achieving progressive realization of our worthy goals. Career planning is not an activity that should be done one time - in school/college - and then left behind as we move ahead in our jobs and careers. Career planning is not a tough activity, not something to be postponed, but rather an activity that should be beneficial and satisfying, providing goals to achieve in your current career or plans for beginning a transition to a new career. Career planning if executed flawlessly is certainly a rewarding and fullfilling experience. Most of us are not sure of what career planning is? For every professional it would be different as every one has different aim / aspiration to grow in their chosen field. The baby step towards career planning is to have your SWOT analysis (Strength, Weakness, Opportunity and Threat) in place. Look for a Coach/Mentor- who can help you in achieving the desired professional goals. Coach can be your Friend; Philosopher & Guide. Speak with your friends, colleagues, peers- they will help you identify developmental needs for yourself. Once the analysis is done, you need to continue to strengthen your strengths while working on your weaknesses. Do not loose focus from OPPORTUNITIES, leverage them.Timelines are extremely important to track the changes in our own persona. You need to have 10% of inspiration Vis a Vis 90% of perspiration to achieve the targeted goal in future. There is no short cut to success. Somebody shared with me a wonderfully stroy on this. One of young manager went for an interview with CEO of X company. CEO asked during the interview, how much you want to grow in life. He replied "just couple of feets". CEO said, what do you mean, can you please elaborate? Yeah, the young manager said, "I want to come across the Table". The CEO asked there are 2 ways to get their. One short cut and another long. Which one you want to go for. He said,"of course, short cut". CEO said, there are 2 ways when you want to be successfull through short cut i.e. either become in-law like me or become an out-law. THERE IS NO OTHER WAY TO SHORT CUT. 1. Business Acumen - The language of business is Finance and we can't afford to be poor at this. P&L outlook /understanding and our ability to anticipate environmental trends is imperative. 2. Change Mastery - Competencies like ability to take all stakeholders along, cultural reinvention, facilitation etc. 3. Domain Expertise – for us it happens to be HR and related competencies i.e. HR strategy, performance management, employee retention and engagement, organizational development, talent acquisition, leadership development, capability building, HR service delivery etc to name a few. Look over and beyond titles and focus on competency building. Every job requires a certain set of skills, and it's much better to focus on skill development than be so myopic as to focus just on job titles. Once you have skills, you will get what you want to get, if not in existing organization, may be in some other. To reiterate, let us focus on building COMPETENCIES! Periodic analysis of career & job trends- Having information about career trends is vital to long-term career planning success. A career path that is expanding today could easily shrink tomorrow or next year. It's important to see where job growth is expected, especially in the career fields that most interest you. Besides knowledge of these trends, the other advantage of conducting this research is the power it gives you to adjust and strengthen your position, your unique selling proposition (USP). In short, Career planning is a tool that help provide you requisite roadmap to achieve your worthy goals . Once you begin regularly reviewing and planning your career, you'll find yourself better equipped for whatever lies ahead in your career and in your life. I certainly agree with you Raj. In my view "Career Planning" is a good idea if you know what you want and if you have an idea of the goals you need to get there. It is imperative to lay out a career development plan so that there is more chance of opening a positive door. Its about looking at long term goals and setting short term ones to get there. But the beauty is that it's a continuous process, so its imperative to keep changing your plan as you move ahead. And this is good because its keep you flexible but also on the right track to figure out what you want with your life. Nice article, Raj. As for career planning, I find every 5 years I need to invest significant time in reassessment and refocus. That seems to be the time frame things evolve personally and professionally. I'm then diligent about 3-year plans with annual components that provide the S.M.A.R.T. approach necessary to achieve the vision. I forget about using S.W.O.T. for career planning. A tool that easily transfers out of the marketing toolkit and into the career planning workbench! I absolutely agree with Raj. Career Planning is an ongoing process where individual explore their interests and abilities. Strategically plan their career goals, and Create their future work success by designing learning and action plans to help them achieve their goals. The Most important part is to look for a Coach/Mentor- who can help you in achieving the desired professional goals. Coaching/Mentoring is a powerful and proven concept in “experiential learning” and has enormous potential in helping people develop to their full personal and professional potential. If we look back into our lives, we can all fondly remember people who have been either formal or informal mentors to us. Without their occasional advice, guidance, motivation, push back, facilitation we would not be who we are today. Very nice article Raj and i completely agree with you. I completely agree with Raj. The onus of owning our Career is truly ours. Hence it is important to mark this journey by systematically planning each milestone. To be resilient in this ever changing trend, the focus should be to continuously invest in building and developing Competencies. I am completely in support with the topic and believe that only a proprer career planning leads to the road of success,until and unless we are not aware about what exactly we want to do we could not achieve it. The process requires a careful analysis of all factors like our capabilities, efficiencies, available opportunities, corporate trends etc. in short one should consider all external and internal factors during career planning. 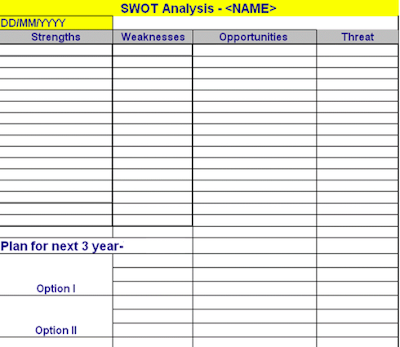 its really nice article , one must focus on SWOT. You are bang on target. career planning is key to growth. It also takes some amount of luck to be in the right spot but by and large luck pans out once you stick to a plan. Fundamentally one needs to be completely honest with oneself - to determine the strength and weakness and build from there. enroute through the rollout one hones skills, gets mentored, puts the learning to use and enriches his experiences. What an article, Mr. Raj! Bang on target and the short story is also very interesting. However, i guess, people fail to do career planning because most of them do not have an idea of their targets. Most of us like to flow with the water and take things as it come. To have a good career plan, one needs to have a fair idea of where does she/he want to reach but that is something which a large percentage of working population doesn't have. An environment of mentoring could have helped overcome this but mentor- mentored culture is still not a part of many organizations , mostly Non IT. 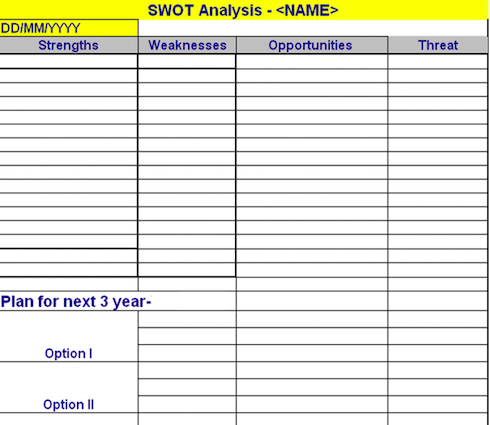 Thank a ton for creating this article and the format of SWOT. A Nice article .... but if u see the present scenario very few align their Intersts and likes with their career. I totally agree with you Mr Raj Gupta.However many who plan to think of career planning are under two different environments. one is a fresher or those who have 3 to 4 years of experience and the other is around 9 to 12 yrs of experience. The environment of the company the influence of individuals within an HR environment, the internal politics, the one-up-manship, the cut throat competition within,the trend, the external environment of recessions roughly every around 9 to 10years turnround, the re-orgnisation of the organisation to trim the HR count, the escalation of cost and the increase in cost of living, the increase in trainng costs to get certifications and so on put an individual at peace to plan. these factors who even if they plan their careers do lose encouragement to pursue relentlessly on to it. Some succumbed to their present professions due to these factors as survival has a major role at a time than planning career. more so when one gets married which is a turning point in life puts the whole balance off due to other family based issues. many realise after 8 to 9 years after the initial storm in their career seems to have settled to plan their career. some are lucky to have them but many are not lucky as they carry on with their existing work not being able to come out from the intricate net of life's setup that are as a result of complicated factors that are beyond a persons control. Hence career planning these days has become more difficult where as job across companies increases the scope of upper salary slot thatswhat people think at the present moment in an environment of rapid change and career in real sense shifts from a period of time to time within a particular domain or across. The other most important factor that the multifunction requirement to reduce cost by companies to take people or talent across also puts in an effect to the career shift among the employees. well ! from my experience career is something not stable and is something intricate which is not restricted to the domain but it is inclusive of position held, fat salary package, perks, place of convenience, authority and so on irrespective of the one one really love to work on what one would have thought long years before at ab-initio level. However it would be good if a person can plan his career or understand what a career is in the present days of rapid change ,it may be very useful to young minds to prosper. Thanks for your detailed inputs. I agree with you that context keep changing over a period of time. In my view, if we have a sense of direction on which path to go it becomes easier. If you do not have an idea on the path to traverse, then path will lead you. Taking charge of destiny certainly help and all those difficult / course changing experiences adds to our learning. Through a difficult situation one of the learning that I got - THREATS ARE THE BEST OPPORTUNITY. We all need a perfect career plan, so that, we can easily develop our success rate. Mostly people are planning for everything and for proper career planning, we should take positive steps, stay motivated, and proper dedication. Positive thoughts and proper planning will bring some limelight towards our career success. I would like to follow the instructions present here on how to get better success in career. Thanks for such a wonderful article.